Well now there's a new car decal craze and it seems to be the slightly weird practice of putting little family stickers on a car. 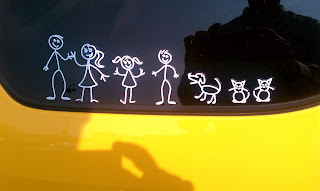 As I drive to and from work each day I seem to notice at least a handful of cars (mostly SUVs and vans) that are adorned with little cutesy stick-figure drawings of various family members. The figures are always lined in a row and often include representations of pets as well. I am assuming these commuting expressionists want everyone to know exactly how many people and animals are in their family. I don't understand the appeal of this and actually think this may be weirder than the oval sticker phenomenon. Does anyone know where this brilliant idea emerged from? Are you one of the millions of cars that have the family sticker motif? Don't be shy, I want to hear why you decided to join in on this fad. I won't judge you either way. Maybe instead of developing the next hot mobile app, I should try to drum up an idea for the next auto decal trend. I randomly found your rant, and totally agree that it is annoying! (Note: I do have a white sticker with MY favorite vacation spot, though). I never noticed this trend until I saw last season's Dexter, where the car decal features as a way for the serial killer to get the names of the family members so that he can kidnap a little boy - as a result I would never consider putting this type of information on my car for the world to see (although in my case, you could figure out we have two kids pretty fast from the two carseats). Ha, my friend Julie is the one who wrote the comment above. I also hate the OBX and the family stickers on cars. I am very anti all bumper stickers. I suspect moms do it because it defines who they are just like for a while post-graduation where you went to school does.